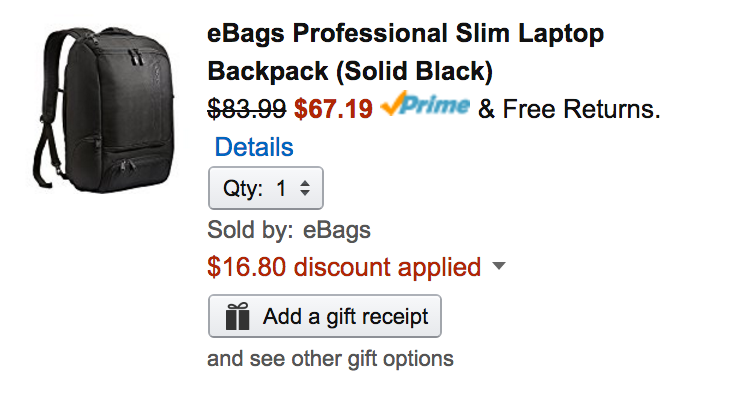 The official eBags Amazon store offers its Professional Slim Laptop Backpack for $67.19 shipped when promo code Q57YWSHH is applied during checkout. For comparison, it usually sells for between $90-$100. Today’s deal is $1 less than the previous Amazon all-time low. Rated 4.5/5 stars. Corporate Casual meets Professional. We’ve taken a different point of view when it comes to a laptop backpack. Gone are the bungee cords, exterior mesh pockets, carabineer clips, and all of the other outdoorsports bling that has no place in a professional setting.The Professional Slim Laptop Backpack features an all-black dress code that doesn’t look out of place in an office setting despite being a backpack. The Heathered Graphite makes a subtle statement.Isolated rapid-access compartments protect your laptop, iPad or tablet, sequester your printed materials, force you to be neat organized by eliminating clutter zones, in a package that defies its published cubic inch capacity. It’s like turbo charging a compact car. Buckle up it’s going to be a great ride.